Continuing further South, Taupo with its enormous lake provided a pleasant spot for lunch and catching up with internet and suchlike. 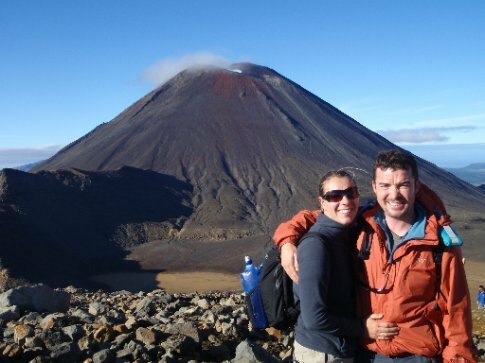 We needed to keep moving so we carried on towards Tongariro National park, stopping at the helpful Turangi iSite for some information on our next trek – the Tongariro Alpine Crossing. The park is a world heritage site, ski centre (rather than resort) during the winter and is dominated by 3 volcanoes, the largest of which Mount Ruapehu last erupted in 2007. Mangahuia DOC campsite, near the park's entrance was where we would strike camp and use as a base for the trek. A nearby hotel, the Discovery Lodge runs an early shuttle up to the trail head so we planned to take it in the morning. Sylvia made an excellent goulash for dinner and we tried an early night in preparation for a 5am start. It rained heavily for most of the night and we weren't well prepared in the morning, having no snacks made for the trek. It was still raining when the alarm sounded and a dense fog surrounded the volcanoes which we could see clearly previously the day before. It really was a horrible day. We were wet by the time we got to the car. The driver at the lodge warned that visibility was low and it was windy so not a great idea. Never were 4 people so happy to go back to a tent. The second attempt went much better. Fresh in the darkness before dawn, up a well marked gravel and slatted path with dawn approaching the foot of the conical Nguaruhoe. Completely clear skies over the landscape below, lakes in the distance. Some recently constructed wooden stairs to soda springs and into the expansive south crater, getting windier at altitude. Was it smoke at the top of the volcano or a cloud? Bitter cold as we made the highest pass into red crater. A strong smell of sulphur at the top, 1886m - steaming vents, the ground warm, hot even to the touch. We caught our first glimpse of the shimmering emerald pools below and took in the otherworldliness of this feast of the senses that was before us. Down the difficult scree towards the lakes, a few others coming up the opposite way, much tougher I'm sure. On past the larger Blue Lake and then a long zig zag down to Ketetahi hut where we munched our sandwiches (this time having the wherewithal to make them the night before) and rested up for an hour. On down through some land which was not public, past some vapour springs, lots of signs warning that access to springs was prohibited but that still didn't stop some American tourists scrabbling over for a gander. Further down, back under the tree line and through a pretty forest to the bus pick up point. A fabulous morning. We chose a campsite that we thought was nearby as no-one wanted to drive too far after the hike. It just so happened that Kawhatau campsite was almost impossible. It took us about 2 hours after leaving the main road. Up one side of a river only to have to return at a farm at the end of a road. Eventually, but only after having to drive through another farm, through goats and dogs and cows and about 10 gates, did we find the place. It was what DOC call a basic site – free, but only a pit toilet buzzing with horseflies for facilities. Wrecked tired – fair play to Oli for driving, we had popcorn for dinner and turned in. We had been on the road for 8 days at this stage so had only one more night in the tent before needing to drop the car off in Wellington. Justin, who Claire and I also met in Rio and who had continued travelling with Oli and Sylvia lived in Palmerston North, on the way, so we stopped in and met him for lunch. Another lengthy journey due to a closed bridge. We had coffee and used the internet in his house, but only after starbucks tried to charge us $10 an hour (no free coffee). Our final site was in Otaki, a few hours North of Wellington. It was another basic site. In this one fires were allowed so we collected lots of wood and made a big one – it had seemed strange to camp for so long without a campfire but at least we got one in to make smores and roast marshmallows.